We’ve partnered with McCormick® Grill Mates® and their Grillerhood community on Facebook to bring you the best in grilling seasonings, easy recipes, and grilling techniques. We’ll be learning from the experts, and sharing tips and tricks from people like you. The Grillerhood is a one-stop grilling resource. This season, the central mission for the community is to create the ultimate crowd-sourced grilling guidebook: “True Rules of Grilling.” Through real-time conversation, Facebook polls and expert input, the “True Rules of Grilling” will compile the wisdom and secrets of the grilling community into the first-ever, definitive compendium of how, what and why to grill. 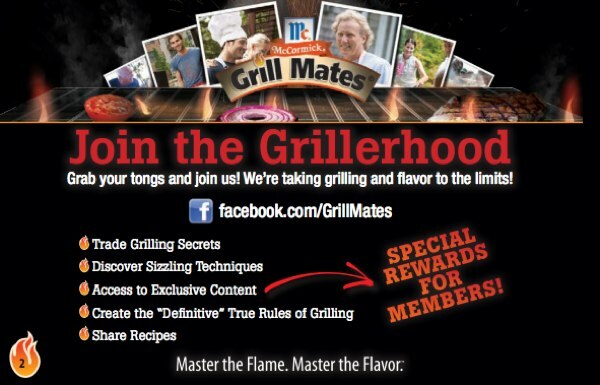 Members of The Grillerhood are also encouraged to share their own “True Rules” — the secrets that take their grilling to the next level — for the opportunity to be declared the ultimate “Grill Mayor.” Beginning May 21, contestants simply upload a photo and their favorite grilling tip to FoodNetwork.com/grillmayor for a chance to win a round trip for two to New York, including a personal tour of the Food Network Kitchens, where winners can discover even more grilling secrets. Three grand prizes will be awarded. Deadline is 7/31/12. Grab your tongs and join us! We’re taking grilling and flavor to the limits! Win This Fabulous Prize Package! Contest has been Extended until Midnight June 23rd! How can you win? Entry is easy! For EACH of the following steps, you will earn ONE entry into the contest. The more you do, the better your chances are at winning. Simply leave a Comment below (that’s 1 automatic entry), telling us which steps you did. We WILL check. One entry per person please (includes all 5 steps). Bonus Entry – Pin the Apron pic on Pinterest! Good Luck! The Contest will end at midnight, Saturday, June 23rd (EST). Winner will be announced Sunday, June 24th! 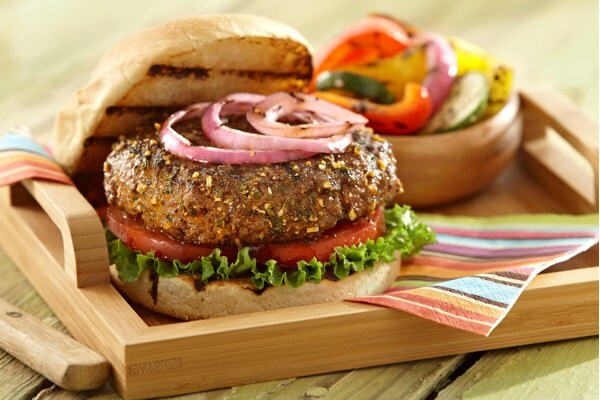 Steakhouse Onion Burger Seasoning seasons ground beef and potato wedges with savory garlic and onion flavors. halfway through cooking. Let stand 2 minutes. Cut potatoes into wedges. Toss with 1 tablespoon of the Seasoning and oil. 2. Mix ground beef and remaining 1 tablespoon Seasoning in medium bowl until well blended. Shape into 4 patties. 3. Grill burgers over medium heat 4 to 6 minutes per side or until cooked through (internal temperature of 160°F). Grill potato wedges 2 minutes per side or until lightly browned and grill marks appear. Serve burgers on toasted rolls. Garnish with desired toppings and condiments. Serve with potato wedges. We grilled baby red potatoes on skewers, and made the burgers as “sliders”. Here’s how delicious ours turned out! Thanks for reading, and don’t forget to enter our contest! Good Luck to Everyone that enters! 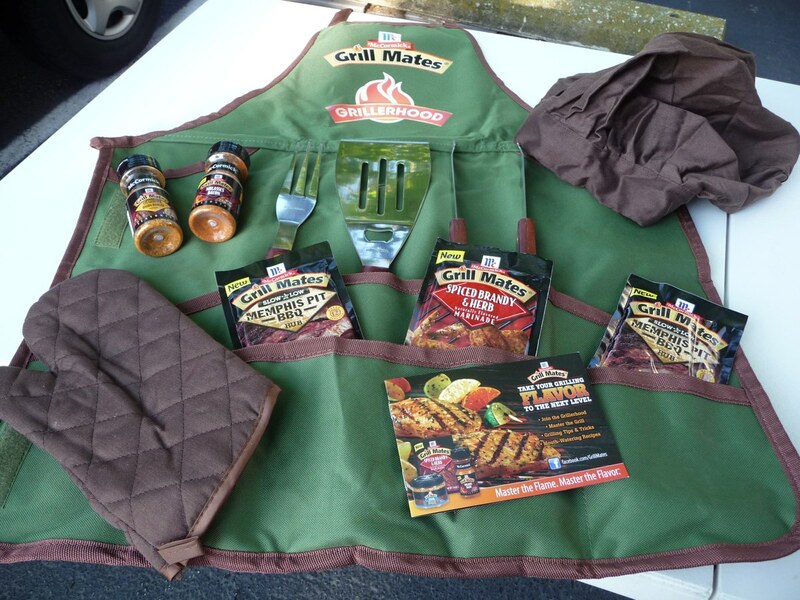 We may (hint, hint) throw in a few extra Grill Mates® goodies to the winner! Haha.. Just kidding, but really, thanks for getting this off the ground. You rock. Good luck. Awesome giveaway! I did all 5 steps. My name on Facebook and Google Plus is Aliyah Weinstein, my Twitter handle is @desabsurdites and my Pinterest username is desabsurdites. Thanks Aliyah! That’s 6 entries including your Comment! I liked on Facebook but I don’t tweet or Google+. Wish you well on the contest!! You’re in. Thanks for the entry, Bob Z! Good luck! I liked Grillerhood on Facebook. The burgers were fantastic, really really good. You all should definitely get in on this! We have a winner! Selected using Random.org, Firehead Thomas is our winner.